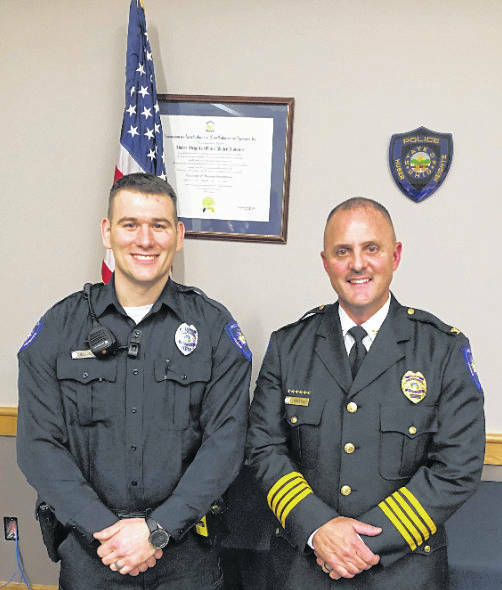 Huber Heights Police Chief Mark Lightner (right) stands with one of the city’s new police officers, Chris Elliott, whom he introduced at Monday’s city council meeting. 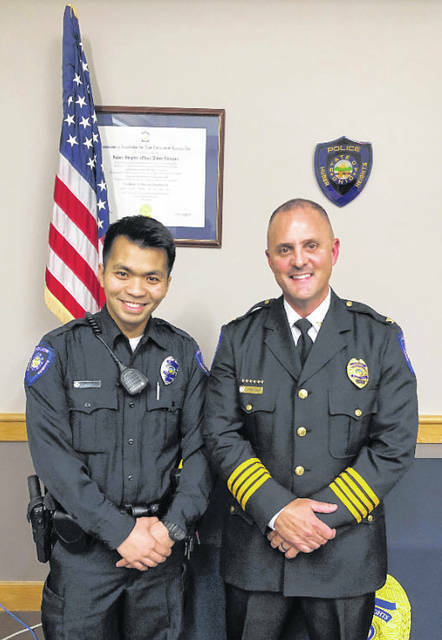 Huber Heights Police Chief Mark Lightner (right) stands with one of the city’s new police officers, Phil Kim, whom he introduced at Monday’s city council meeting. HUBER HEIGHTS — It was a big night for first responders Monday in Huber Heights. Two paramedics and a dispatcher were honored by the city for their lifesaving efforts and two new policemen were introduced to the city at Monday’s city council meeting. Firefighter/Paramedics Brian Koss and Corey Gebhart and dispatcher Nicole Ward were presented with awards for saving the life of Huber Heights resident Bill Ames on Jan. 17. Ward’s quick work dispatching help and the paramedics’ proper diagnosis and quick response were directly responsible for saving Ames’ life after he suffered a heart attack in his home. Battalion Chief Keith Knisley and Medical Director Dr. Charles McIntosh explained that all three city employees exceeded the benchmarks set by the city to measure call processing time by dispatchers, faster response time by paramedics and paramedics’ ability to recognize data provided by electocardiograms at the scene. Guidelines for the award were developed by McIntosh and Lt. John Russell of the fire department. Ames, a former Riverside police chief, suffered the heart attack on Jan. 17, which happened to be the night before his birthday. He said the quick response by paramedics saved his life. “I wouldn’t have made it if it wasn’t for what they did for me at the house,” he said. Also Monday, Police Chief Mark Lightner introduced two new police officers to city council. Chris Elliott is an Air Force veteran who was deployed in Saudi Arabia, Iraq and Qatar. He has a bachelor’s degree in criminal justice from Ohio University and is a graduate of Springfield North High School and the police academy at Clark State Community College. Phil Kim was born in Vietnam and came to the United States when he was eight years old. He is a graduate of Centerville High School and Sinclair Community College. Two Huber Heights employees who have been promoted to new positions also were introduced to council Monday. City Manager Rob Schommer announced that Lee Anne Porter has been named the city’s new community development coordinator and Jason Foster has been named the city’s new economic development coordinator. Schommer said the new positions are part of the city’s program to focus on business retention and expansion, community engagement, fiscal issues, and community planning and development. Julie Sullivan of the Dayton Development Coalition was on hand to address council about the coalition’s role in promoting regional development. Porter and Foster will be working with the development coalition as a part of their responsibilities. Appointed eight members to the new Huber Heights Military and Veterans Commission. They are: John Berkowitz, Hugh Brenner and Louis Brown, appointed to a term ending Dec. 31, 2019; Ray Girard, Albert Griggs and Daniel Hof to a term expiring Dec. 31, 2020; and Jeffrey Johnson and Elizabeth Solomon to a term ending Dec. 31, 2021. Appointed James Jeffries and Sandra Opp to the Huber Heights Planning Commission. Jeffries’ term ends Jan. 31, 2020 and Opp’s term ends Jan. 31, 2023. Approved a resolution to advertise for bids for the purchase of self-contained breathing apparatus for the fire department. Most of the cost of the purchase will be paid for by a grant from Federal Emergency Management Agency. The city’s 10 percent match for the purchase will come to $21,684. Passed a resolution creating a special tap-in district for homeowners in the area of the Chambersburg Road Phase III widening project. Council’s next meeting is Feb. 25, 7 p.m., at city hall. Council will hold a work session Feb. 19, 6 p.m. at city hall.